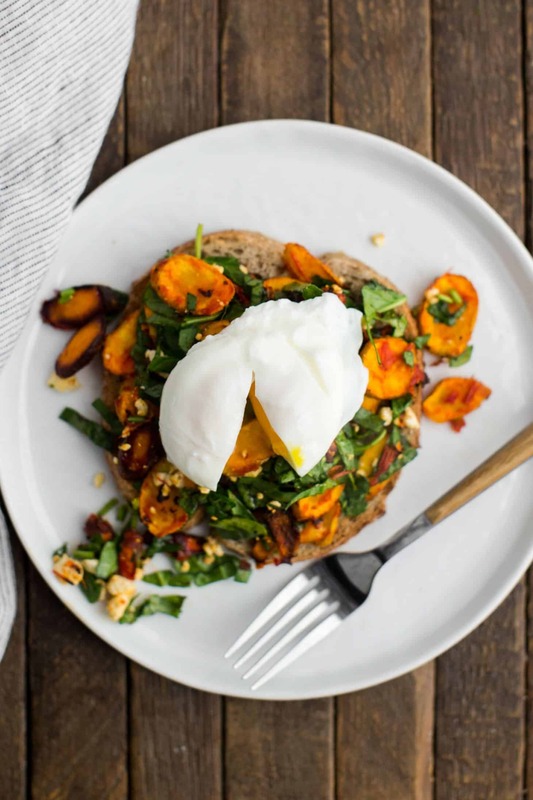 Harissa Roasted Carrot Toast | Naturally. Living in the midwest for a good chunk of my life, I always looked forward to March- a time of transition into spring. The first day I could open the windows and let fresh air in felt like a treat and the promise of fresh produce towards the end of the month was enough for me to get excited. So, March for me is all about transitional meals- a little winter produce mixed with a little spring produce. This carrot toast is first up. Roasting carrots in harissa is a great way to dress them up as the slight spice from the harissa compliments the sweetness of the carrots well. This toast is a prime example of what I eat for lunch days I’m not working on recipes: roasted vegetables, eggs, and some sort of carb. 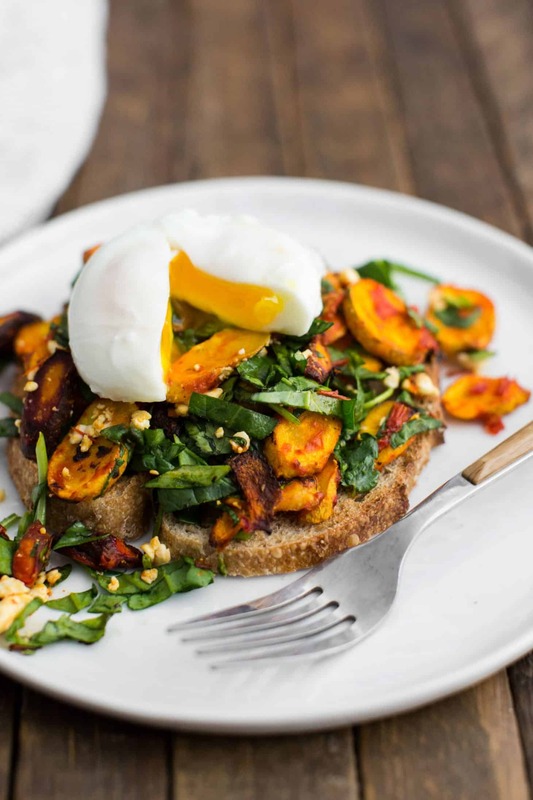 There are quite a few routes you could go with the roasted carrot and all are just as good as this toast. Preheat oven to 400˚ F and line a sheet tray with parchment paper. Wash carrots and cut into 1/4″ thick. Place on the sheet tray and toss with harissa. Roast until carrots are tender, browning and slightly tender, 15 to 20 minutes. Right out of the oven, toss with spinach, feta, cilantro, lemon juice, olive oil and salt (if using- depends on if the harissa is salty). Top toast with carrot mixture and finish with the poached or fried egg. + The toast is really good if you plan on having a runny egg. If you’re not a fan of poached or over-easy eggs, I recommend using the carrots in a different route, like a salad or stuffed in an omelette. 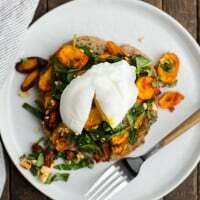 The star of this recipe is the roasted carrot mixture- the toast and egg is just a way to enjoy it in meal form. However, the carrots can be great in many different settings, depending on what what kind of meal you want to prepare. Salad: This carrot mixture is great tossed with greens and/or grains. Instead of adding the spinach mixture to let it wilt slightly with the carrots, wait until the carrots have cooled and toss with a couple handfuls of greens and grains. Then, top the salad with a lemon vinaigrette. Omelette: I’ll make double the amount of carrots and save part of the mixture to stuff in an omelette for breakfast. Vegan: Wanting to use the carrots in a vegan way? Ditch the feta and make this meal into a grain bowl with some tofu, chickpeas, and/or hummus. That looks delicious! I’ve been looking for a way to combine vegetables with lunch (other than an omelette or salad) but hummus or cucumber with cheese on toast is sort of all I can think of. Thank you for sharing, I’ve got some carrots lying around! I’ve honestly never thought of putting carrots on toast, but this sounds delicious! 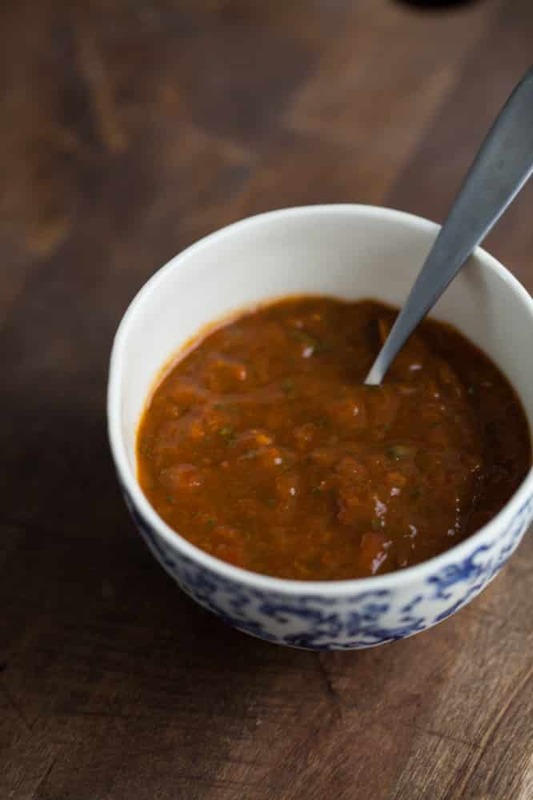 What a lovely harissa recipe! Harissa goes really well with carrots and eggs.